On our second day of shooting we headed up to Thousand Palms Oasis, a spring fed oasis surrounded by, yes, lots of palms. In the hundred degree heat of the Coachella Valley this oasis is a wonderful contrast. The oasis is on Thousand Palms Canyon Road just off Ramon Road in Thousand Palms, less than an hour’s drive from Palm Springs. The palm encountered in the oases within the Preserve is the California fan palm, or Washingtonia filifera. It is the only indigenous palm in California. There is anoother palm used widely in the southern California area, the Mexican fan palm, or Washingtonia robusta. It is a native of Baja California. This native palm is only half as tall and thicker in the trunk. The tall ones you see all over LA are the import. We got there just before sunrise to catch the sun as it hits the oasis in first light. This pano was stitched out of 6 shots, click on it to see it in its full glory. 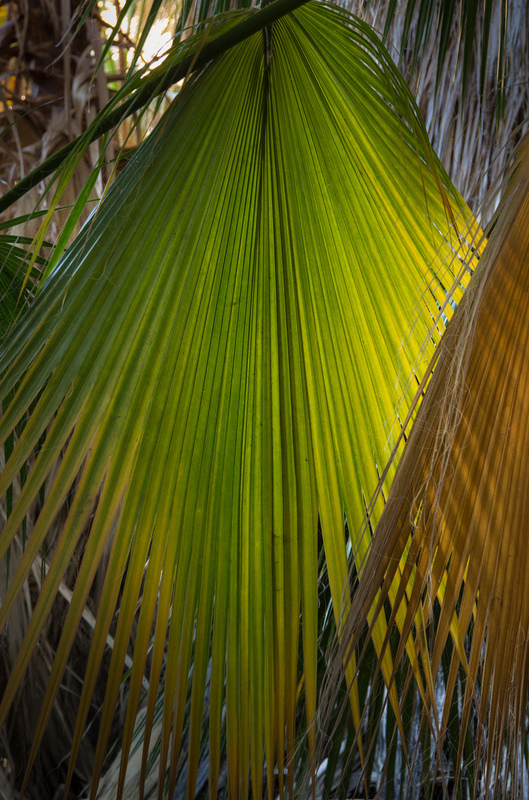 The palms are a great abstract pattern and one that David uses to get photographers thinking in terms of abstract form and color. Here’s one from the swampy area of the oasis. 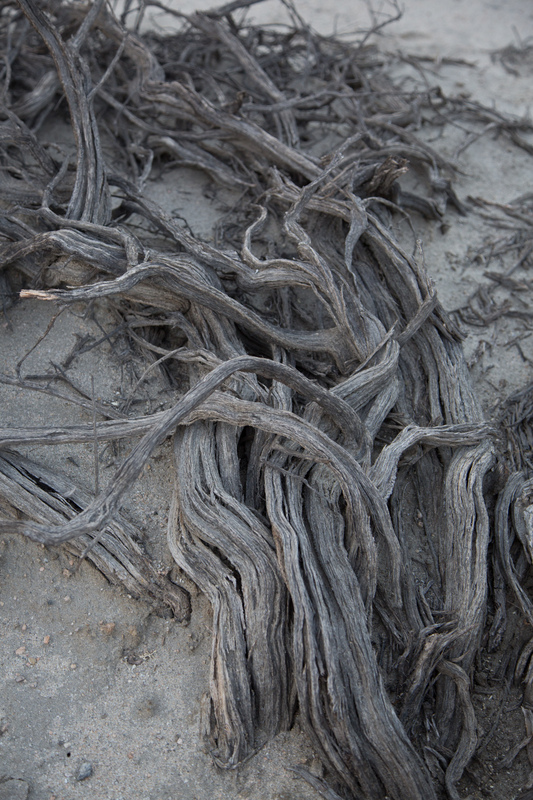 Shot of some driftwood-like roots in the area (below). The trick here and in the shot above is to eliminate all elements that detract from the formal patterns you’re trying to capture. Allow distractions or bad light to pull the eye and the dynamics of the shot are weakened. Just up McCallum Trail from the main oasis is the McCallum Grove and a perfect little pond. 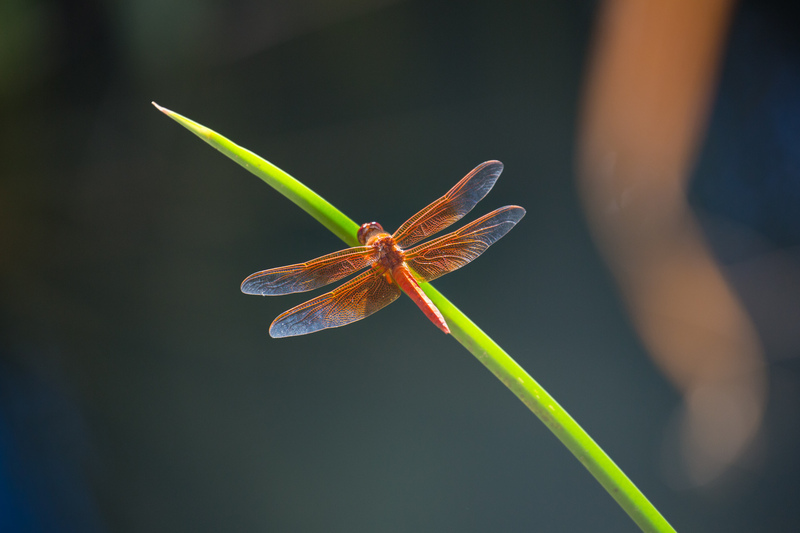 I lucked out and got a dragonfly sitting on a reed. Shot at 300mm, F-5.6.